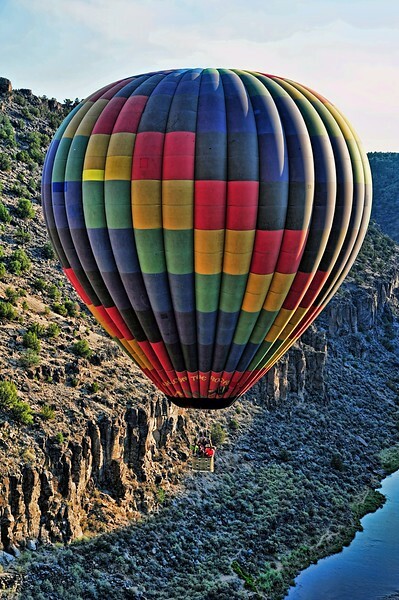 This is the last of the four balloons that were flying in line down the Rio Grande Gorge. Being able to take a hot air balloon ride was one of the things on my "Bucket List" that I'm now able to scratch off the list. But I can tell you that the ride was so much fun, that I'll do it again if I ever get the chance. It's so quiet and peaceful being above the earth early in the morning. It's a very cool experience. I'd highly recommend it to all Smugmuggers. Check out the detail in the larger sizes - processed with Topaz Adjust using the mild detail filter. Thank you all for your comments on yesterday's balloon shot, they are very much appreciated! Looks like a fun ride. Nice perspective, above rather than below. Love that the colourful balloon fills the image. This looks like a great experience, and I love your being above the balloon you are shooting. Usually we get them from down below, so it's a nice perspective. WOW nice capture. Dont ya just love Topaz, I use it alot on my scenic shots. Makes the detail pop for me. Great perspective & colourful shot! Fabulous shot, the balloon has such wonderful colors and pattern and the landscape is fantastic as well. I took a balloon ride over the Nile and the Valley of the Kings at sunrise, it's amazing, something I won't ever forget! Sorry if I've told you this before, but I know just how you feel!!! Amazing shot, I am so jealous!